The past few months have been a flurry of sewing. Sewing, sewing again, and sewing some more. I made 2 dresses, one just because, and the other for my oldest daughter's First Communion. It all started one fateful day in February (it feels like so long ago I'm not actually sure when it really was). We rented "The Adventures of Ichabod and Mr. Toad" from the library. 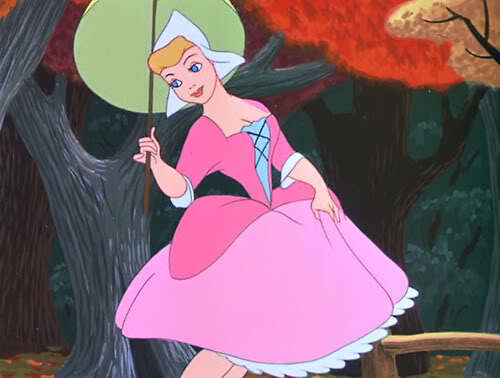 Both my daughters were immediately smitten with the character of Katrina Van Tassel from the moment she hit the screen. And of course, both girls immediately asked me for a dress just like hers. 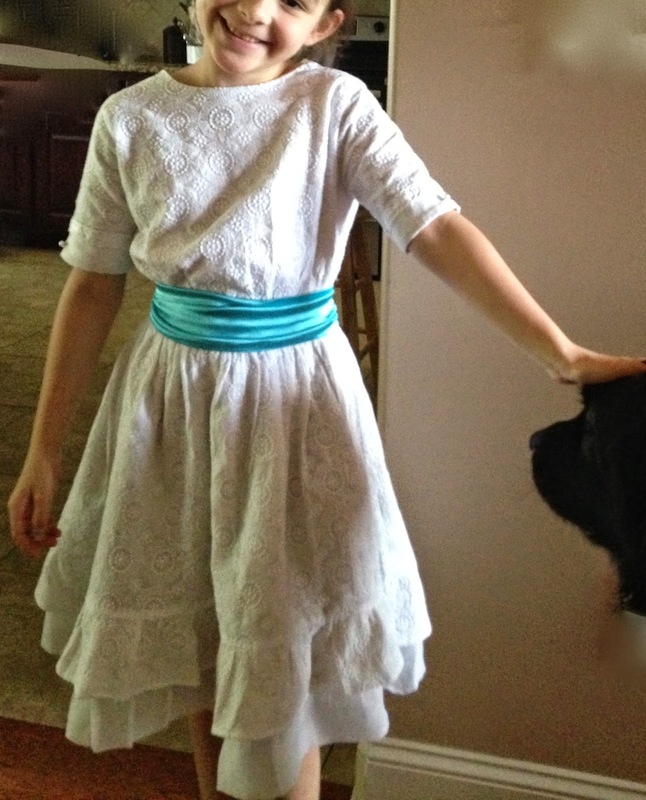 Which gave my oldest the epiphany that it would look great as a dress for her First Communion. So I immediately turned to Sense and Sensibility, a pattern company that specializes in historical patterns. I knew of other women who had taken Sense and Sensibility's 1780s Portrait Dress Pattern and used it for their daughters' First Communion gowns, and they all turned out lovely. And the portrait dress was close enough in style that I could make it look like the one in the movie (more or less) with a few alterations. I decided to make one for my youngest first, as a sort of trial. Like any decent seamstress (or wannabe), I measured my children first. I decided to try to be good and make their dresses according to their measurements, not according to what size they normally wear. According to the instructions on the pattern, my 2T daughter was too small for a size 1. I made a toile for her out of white cotton lawn (in size 1) and tried it on. It was a little large, but she would grow to fit it, right? So I let her pick out some material and she chose a white and pink cotton I had bought a few years earlier. I had intended to make one of my girls a dress with it, and neither one wanted it at the time. I used the toile as the lining and put both bodice and lining together, then tried it on my daughter. Still the fit was big, even accounting for the fact that the back would have to overlap a little once I sewed on the hooks and bars. Now comes the interesting part. I cut out the sleeves, attached them to the bodice, tried it on, and...it was way too small. I could barely get the bodice to meet in the back. I should mention that during this time I switched to giving my children raw milk and they both jumped sizes. My youngest went from a 2T to a small 4T, and my oldest from a 6 to a solid 7 (6x is in between those sizes, so technically she jumped 2 sizes up instead of just one). I only had so much of the pink and white cotton, and couldn't get any more. It was a limited edition print from 2007 I think. So using all my brainpower, and my patience, I cut traced out the pattern pieces for a size 2, cut them out of lawn, then puzzled my way through getting the pieces I needed out of the small amount of material I had left. There wasn't enough for size 2 sleeves as well, so I laid the pattern piece of the size 2 on top of my size 1 sleeve, which was tricky getting it to fit but basically the sleeves just had smaller seam allowances. With that little problem resolved, I turned my attention to the skirt. For the overskirt, I used the pink and white cotton. Then as an underskirt, I bought some bright pink cotton (egyptian, maybe?) and lined that with the white lawn. Once I attached the skirt to the bodice, I was able to split the overskirt up the middle. Somewhere around this point my daughter stopped letting me try the dress on her for fit, and I started getting nervous about needing to start my oldest's First Communion gown. So I stopped where I was (and hope to finish hems, and put pick-ups on the sides of the overskirt) sometime next week. Again, I measured my oldest, and came up with a size 4. There was no way I was going to make a size 4 for my 8 year old. But since she was, at the time, still wearing some things that were size 6, and size 8 in anything was still much too big, I decided to go with it. Again, I traced, then cut out, the pattern pieces and the bodice lining. I tried it on her and it was massive. I hoped that since Communion was almost 2 months away it would fit by then. For this dress, I didn't want the typical satin or taffeta boring stuff. I bought instead a semi-sheer cotton lawn that I knew would be both soft and lightweight to keep her from getting too hot in a dress with elbow-length sleeves. Like the pink dress, it would cut away to reveal an underskirt, which I opted to make out of poly charmeuse (silk charmeuse is ridiculously hard to work with), which would provide a nice dressy sheen but be incredibly soft and fluid and feel wonderful against my daughter's skin (yet another reason to avoid the stiffer stuff - I didn't want her to hate wearing it because it was rough). I cut out the bodice from the cotton lawn and attached it to the lining. Still big. I put the sleeves on and suddenly, it didn't fit. At all. After puzzling it out for a while, I came to the conclusion that if I rotated the sleeves it might fit better. I took them out, rotated and re-stitched them. It worked! Now it was time for the part I had been anxiously awaiting. The details! This is the original seamline on the lace. It took me forever to find all the stitches so I could carefully take them out. It's actually really easy to spot them on this photo, compared to real life. If I was smart, I would have just taken a photo and used it as a guide instead of all that searching. It was slow and careful work, and I felt absolutely terrible about cutting it into 2 pieces to attach to the sleeves. To help keep it away from my daughter's skin oils, which could damage the lace, I made a sleeve ruffle out of lawn and attached the lace to that before sewing it onto the sleeve itself. I also sewed all the other seams as french seams as well. I tried to make this dress as well as I could so it would be a true heirloom. And also so that it would be worthy of that lace. I feel like a vandal for having to cut it up. Everything was well and good. Then I tried it on my daughter and lo and behold, it was too small. I wanted to cry. But instead I left it alone for 2 weeks before I got up the gumption to take it apart. I traced new pattern pieces, this time for the size 8, and made a new bodice. I wouldn't have enough material to cut out a size 8 skirt, but that was ok, because when I measured it, it was longer than we wanted it to be for the sake of ease of movement during the Mass. I also made a neck ruffle this time around because my daughter complained that the neckline was too low. Anything that shows her collarbone is too low. I also made the sash she wanted, out of teal poly-charmeuse. It was a little too bright for my tastes, but she had seen another white 1780s dress with a teal sash online and wanted hers to be like it. I took the lace ruffles off of the size 6 and re-sewed them onto the new dress. Then along the side gathers of the skirt (pick-ups) I sewed on some more lace. I also played with the idea of adding a piece of lace to the sash, to tone down the color a bit. A pearl button (non-functional) gives just the right touch. You can see the blue thread I used to stitch the pick-ups. I thought blue would make it easier for me to see and less easy for me to confuse with some runaway thread that needed to be clipped. Then I placed my sister's old slip - it had a crinoline of sorts in it- underneath and it started to transform the dress. At this point I had my girl try it on. I was ok I guess. Sorry there are no fasteners on at this point. I was no dummy. I was going to sew those on last so that I knew it would still fit. She told me she wanted lace around the collar, but going around the bottom. Here's what that looked like (pinned, of course, not stitched). It didn't work. She said no way. But she did change her mind about the lace and wanted it up against the ruffle. This was delicate and tedious work, to make it stay but also I had to be careful not to tear it. I put the lace against the lighter sash as I sewed on the lace at the top, still trying to convince my daughter. It hung by the breakfast nook everyday so that she could see it. Still no. And then, one miraculous day she agreed to it. Yay. That was great and all, but the dress still needed a little something extra. Just for kicks, and without getting permission, I sewed on a row of pearls just under the bottom of the lace ruffle. The veil she would wear had a row of pearls too, and since the lace definitely didn't match, I wanted something that pulled the two together. It made quite a difference. Then came the also tedious work of sewing the lace onto the sash. It was torn in a few places, and I also didn't want all my stitches to show through on the backside. Just keepin' it neat, you know. Then came the part where I had to sew on all the hooks and bars - all six of them. At first I put the hooks too close to the edge and when it was fastened they stuck out. So I had to take them out and put them on again, farther away. Lastly, I sewed some pearls onto the sash. It was be-u-tee-ful! It made the dress so much more that the thing I had been staring at every day for weeks. I must admit I am pleased with the way it came out. Particularly since I was having some serious doubts about it. But most importantly it was exactly what my daughter wanted. I was retarded and didn't bother to get any pictures of her (by herself, that is) in her dress on the day of First Communion. My mother did that for me. But I dont' have any of them yet. Here is a picture to show what it looked like in action. Sorry it's a little blurry but somebody was pulling at my arm and asking me for Spry gum or something. I have some group pictures of her from the front but it doesn't really give a good idea of what the dress really looked like in person. I should also mention that my husband came home from Afghanistan for a break and made his First Communion as well, side-by-side with our daughter. This photo was taken after the ceremony. As I made her dress, instead of listening to music like I always do, I watched "Ben Hur" over and over again instead. I found it quite nice as background noise, since I really like the soundtrack. But I HAVE to ask this, because it's been bugging me for months now - has anyone else watched that lately, and if so, have you noticed that a lot of modern popular songs have totally lifted chords from the soundtrack? I don't really listen to the radio so I couldn't list song titles and artists, but I know for darn sure I heard some of Jimmy Eat World's "Sweetness" in the Intermission overture. Listen also to the song when Judah marches into Rome after the boat wreck. It's hilarious if you recognize the pop song I'm talking about ( I know a few of the lyrics but that's about it).